How did Tyrone Power come to advertize the Buckhorn Bar? September 3, 2017 -- I got an email yesterday from one of my readers with an image from an old advertisement in the Buckhorn Bar in Laramie, a colorful place with bullet holes in the mirror behind the bar. The advertisement reads, “True Cowboys drink and smoke at the Buckhorn Bar, Laramie, Wyoming.” The question posed was who was the person in the ad wearing a cowboy outfit and holding a cigarette? My reply was that the cowboy in the ad, who is obviously not a cowboy at all, was probably a male model. My friend replied that others to whom he sent the same picture, said they thought it was the movie star, Tyrone Power. My second reply was that I didn't think it was Tyrone Power because there would be no way that even a collection of bars could afford to pay him for the use of his image in this way. But I did more research into the question. It turns out that in fact it is Tyrone Power's image on the poster ( and on a similar poster for the Garden Bar in Bigfork Montana). But how in the world would a big movie star like Tyrone Power (one of the top 100 box-office moneymakers of all time) end up in such a poster? His name isn't even on the poster! It is just weird. Intrigued, I dug deeper. After doing image searches on Google Image Search (try doing the search Hollywood stars Chesterfield) I found out that the exact same image of Power in the bar posters is also found in this 1950 Chesterfield cigarette advertisement. Chesterfield, made by Altria and produced by the Liggett & Myers Tobacco Company was a prominent cigarette brand in the 1950s. Other Hollywood stars promoting the Chesterfield brand included Gregory Peck, Joan Crawford, Bing Crosby, Lucille Ball, Bob Hope and many others, nearly 200 Hollywood actors altogether. Some of the same actors also advertised other cigarette brands. A number of these advertisements in which movie stars plug cigarettes also include advertisements for movies starring that same actor. For instance the 1950 Tyrone Power cigarette ad I found also plugs the movie “American Guerrilla in the Phillippines,” starring Power. This kind of product cross-advertising is still used today in TV ads for both products and movies. Because the ads promote both tobacco products and movies, and because tobacco companies pay movie studios in return for movie stars smoking cigarettes in movie scenes, this led me to think that the Buckhorn Bar advertisement is a kind of side effect of a studio contract involving both Tyrone Power, and one or more tobacco companies. 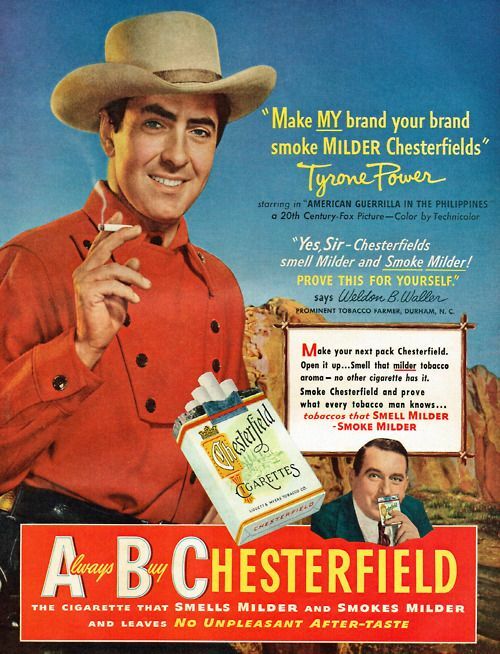 The study adds, “To participate in this lucrative partnership, the studios also repeatedly bypassed their own 1931 ban on actors’ product endorsements.” If there was an existing ban on actors endorsing products, it supports the idea that the Tyrone Power ad for the Buckhorn Bar was there primarily because it was part of a pro-tobacco campaign. Probably the money behind that poster came not from bars, but from the tobacco industry.